Have you visited Sardinia? Tell me your experience if you have. 🙂 It reminds me of my solo travels to another island of Italy - Sisily. It was also in February. :) So today I'm sharing some views I captured in Taormina on Sisily island. 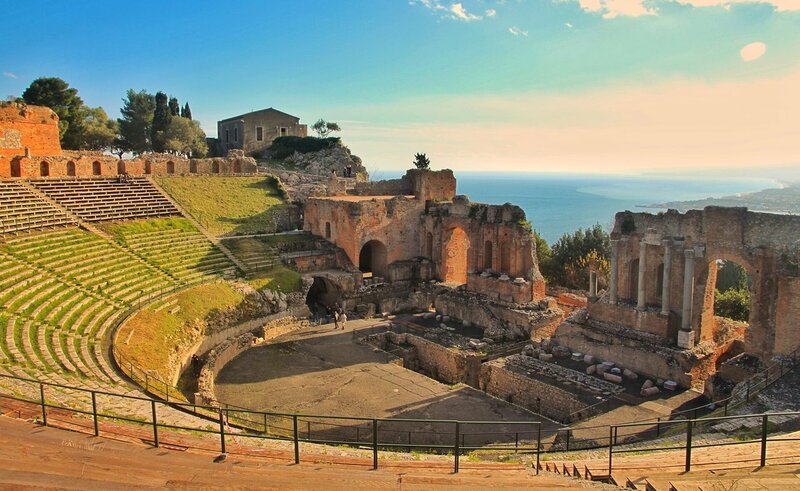 I took a local bus from Catania to Taomina to visit this well-known ancient theatre. From the town, I started to walk uphill. It was a beautiful hike. On my way, the cone of Etna volcano could be seen in distance, shrouded in fog and cloud from time to time. After passing loads of cacti and gravelstones, I reached the hilltop where the theatre spreaded before my eyes. The theatre's construction was started by the Greeks around the third century BC, and later it was renovated and expanded by the Romans. This well preserved archaeological wonder is located in an amazing natural setting, with spectacular view toward the Calabrian and the Ionian coasts, and you can have a clear view of the famous peak of Etna if weather permits. It is a place that easily brings people back to the ancient times. It was winter time, so it's pretty quiet, with around 5 visitors in total. I sat on the step half buried by green grass, facing the vast blue sea and imagining how people in the past was watching those grand shows here. Must be quite an experience, isn't it? Later, on my way back to town, I arrived at a viewpoint at sunset, lucky me! So I got to see this splendid scene in the head image. 🤗 Hope you enjoy this view as I did!